The forces of globalization and the advancing capability of technology are dramatically changing the world in which nations, companies, and individuals compete ever more intensely with each other. As Erik Hanushek concludes in his new book, “The Knowledge Capital of Nations”, in today’s digital economy, “long-run economic growth is overwhelmingly a function of the cognitive skills of the population.” Specifically, Hanushek has estimated that improving K12 performance in Colorado could double the size of the state’s GDP. If we want a growing economic pie in the future (which would surely help us to address many of the problems we face), then we cannot avoid the urgent need to do a much better job of educating our children in the present. This is also why Foreign Affairs magazine has highlighted improving K12 performance as a critical national security issue. For an excellent (if painful) comparison to the way U.S. schools function today, read this eye-opening report on how Asian nations are preparing their students to survive and thrive in the 21st Century (and this commentary on it). The Colorado Department of Higher Education has estimated that by 2020, 74% of the jobs in Colorado will require a post-secondary education. 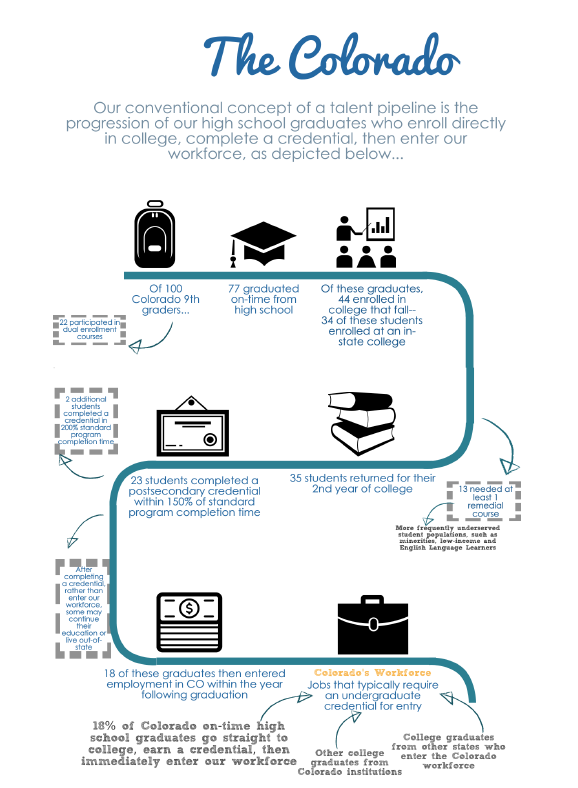 Unfortunately, as shown in the following chart from the Colorado Talent Pipeline Report, our public schools are currently failing to meet this need, forcing companies to import talent from other states and nations to fill the jobs they are creating. Our core belief is that business leaders have a critical role to play in improving the performance of our public schools, through their contributions in three areas that drive faster experimentation and adaptation: (1) Better analyses and understanding of student achievement results; (2) Improvement of key school district management processes (innovation, implementation, and evaluation); and (3) Strengthening core school district governance processes (direction setting, resource allocation, and performance monitoring). While improvements in these critical areas are not sufficient on their own to substantially accelerate the growth of “knowledge capital” in Colorado, they are undoubtedly necessary. And in many cases, they don’t require more funding. But these improvements will not happen in the absence of sustained engagement between our state’s business and K12 district leaders. One of the reasons we founded K12 Accountability is to provide business leaders with the evidence and analyses they need to seriously and successfully engage with K12 district and school leaders.